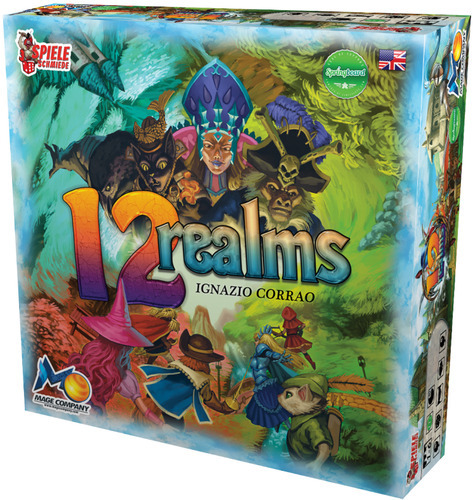 12 Realms is a game by Ignazio Corrao, published by Mage Company. It is for 1-6 players. In this game, players will become one of the heroes of legend as they work together to defeat the Dark Lords from invading their realms with a horde of minions. Along the way they must claim a powerful artifact if they hope to vanquish their foe. If the players are able to defeat the Dark Lord of each realm, they will be declared the winner. To begin, players will decide which realms they would like to use in the game. They must then gather all the different components for each realm that is to be used. Players then will separate the Realm cards removing all of the ones with the Lord of Darkness symbol on it. Players then choose one for each realm. The Lord is placed near it’s corresponding realm along with it’s token. Players then choose their Hero card in turn order. The Hero miniatures are placed on the town area of their chosen realm board. They also receive the required amount of talent tokens to place on their Hero card on the talent symbols. The realm cards are shuffled together for only the realms that will be played excluding the town cards and previously mentioned Lord cards. These are then placed face down next to the play area. The town cards are then shuffled together and placed face down on the table. Players then gather all the tokens that correspond to each particular realm in play and place them next to the board. A randomly chosen artifact is placed on each board on the VI area. Treasures are placed on the I and II areas. The invasion marker is placed near the invasion track at the bottom of each realm. Play now begins. The game takes place over 3 phases; invasion, perform actions and refresh. The first phase is the Invasion phase. In this phase, the Invasion markers for each realm are moved forward one space for each invader token on its board. Certain invaders powers are then resolved such as curse, marauding or summon. Players will then draw 2 cards per realm plus 1 extra card. If there are invader cards drawn, the area die is rolled and the corresponding token is placed on the matching area of the realm board. The card is then placed in the discard pile. If a treasure is drawn, a treasure token is placed on a random area on the board. If an artefact is drawn, the corresponding token is placed on a random area of the board. These are required to defeat the Dark Lord of that realm. The next phase is the perform actions phase. In this phase, starting in turn order, players are able to have their heroes perform actions as long as they have enough tokens of the right kind to be able to do it. Players can move their heroes from one area to another. They can confront an invader by using the corresponding tokens that exploit the invader’s vulnerability. They can claim treasure if they are in the same area as the treasure token and can exploit its weakness with the correct tokens. They can also claim artefacts the same way. Players are able to trade artefact tokens and gold coins if they’re in the same area. They can also visit town by exploiting a swiftness token, drawing two cards and keeping one if they are able to pay the required amount of gold. Players can travel between realms by traveling from one town to another. The third and final phase is the refresh phase. In this phase, players will refresh all their exploited talent tokens making them available to be used on the next turn. The game continues until the invasion marker moves over one of the red marked spaces. At that time, the Dark Lord enters play. Players must have 3 artefact tokens before they are able to confront the Dark Lord of that realm. To defeat them the corresponding tokens must be exploited just like any regular invader. When a Dark Lord dies, all the invaders in that land die as well. If on a future turn invader cards are drawn for that particular realm they do not summon any new invaders of that kind. When the last Dark Lord is defeated, the game is over and the players are the winners. However, if the invader token moves over the last track’s space, the players have lost and the game is over. This game is a masterpiece of beauty and design. All of the different cards, tokens and miniatures draw you in to the fantastical worlds that have been created here. The cards are gorgeous with lots of great artwork. The tokens have lots of nice designs. They are nice and thick cardboard and are really nice to look at. The dice are great and quite unique. The coins are made of plastic and the invasion markers are made of wood. Both of these simply add to the quality of the game. The boards are very sturdy and are like looking at a beautiful painting. The hero boards are fabulous and have great character designs. Of course the star of the whole game is the miniatures. These are outstanding. The detail on each one of these is simply amazing. I’m blown away at how nice these look. There was no expense spared at making sure that this was a quality looking and designed game. I love every single piece and can tell you that I already want to add the extra miniatures and cards to complete the game. That’s how amazing this game really is. The rulebook is just like the components, top quality. From cover to cover, there isn’t a much better looking book. There are so many pictures and examples that it’s easy to get lost in the beauty. Everything is explained really well and is quite simple to read through. There are break downs for every piece from heroes cards to Dark Lords. There are explanations for the hero boards. There’s a great suggested setup for every number of players as well as a great layout of how everything should look. There’s a detailed area for invader powers as well as advanced rules for adding in various pieces and parts such as the Black Fortress. There are rules for using buildings and trade as well as the Dark Player variant where one player controls the Dark Lords and their minions. There are lots of different variants including the Crab, bonus town cards and promo invader cards. There are a couple of pages on clarifying the rules on certain things that might seem a bit fuzzy. There’s a great component checklist as well as several pages detailing each of the town cards. Finally the back cover has a great player aid for symbol interpretation to help you understand what each icon means. All in all, this is one detailed and well thought out book full of information and beauty. This is a fairly straight forward and easy game. It takes a little bit of time to get used to what the different icons mean but thankfully that’s made a bit easier with the player aid on the back of the rules. It does have a little bit of strategy and some mild player interaction but that’s mainly from the trading of gold and artefacts. There’s a lot of different ways to play the game thanks to all the different variants in the rules. I like that the difficulty can be ramped up or adjusted for easier games depending on the level of play you’d like. It’s easy enough that my 4 year old can play it. She loves the art and the miniatures. It’s a simple thing of helping her to use her talent tokens on the right thing. That’s another great part about the game being co-op instead of versus. In any case, the game takes a rather long time, usually about an hour and a half. That’s a bit longer than my 4 year old’s span of interest. In the end, I have to finish the game by myself. I’m hoping that as she gets older, this will be one that she sticks around to finish. For now though, the game is really good and one that we like quite a bit. 12 Realms is a great fantasy themed game that adapts well for every level of difficulty. It’s a bit of a long game with most sessions lasting around 90 minutes or so. The artwork, theme and components are all beautiful and they will pull you into the game rather well. Fans of fantasy and fairy tale games should really enjoy this one. It’s very simple to learn and play, however the iconography takes a bit of time to get used to. The player aid on the back of the rulebook helps out quite a bit. There are lots of great variants and changes that can be made to the game to make the replayability of the game very high. This is a rather good game that is rather fun. It doesn’t have as much of a co-op feel as I’d like and the strategy isn’t that deep but that’s the only minor flaws in the game. All in all, it’s one that should appeal to a very wide range of players. I definitely recommend it. For more information and this and other great games, please check out Mage Company at their site. This entry was posted in Reviews and tagged 12, 12 realms, board, board games, card, card games, company, corrao, games, ignazio, Ignazio Corrao, mage, mage company, realms. Bookmark the permalink.